In part two of a five-part series on finding value in your fantasy hockey draft, today's article will focus on right wings (read Part I on left wings here). Specifically, we're interested in using the Yahoo average draft position (ADP) to not only determine the best players to target in your fantasy hockey draft, but also when to target them. The assumptions made in this article include the following: (1) you're in a Yahoo standard league, (2) your league has 12 managers, and (3) your league is not a keeper league. Before we jump into the details of which right wings are undervalued, it's important to get a handle on how managers are behaving in their fantasy hockey drafts so far. 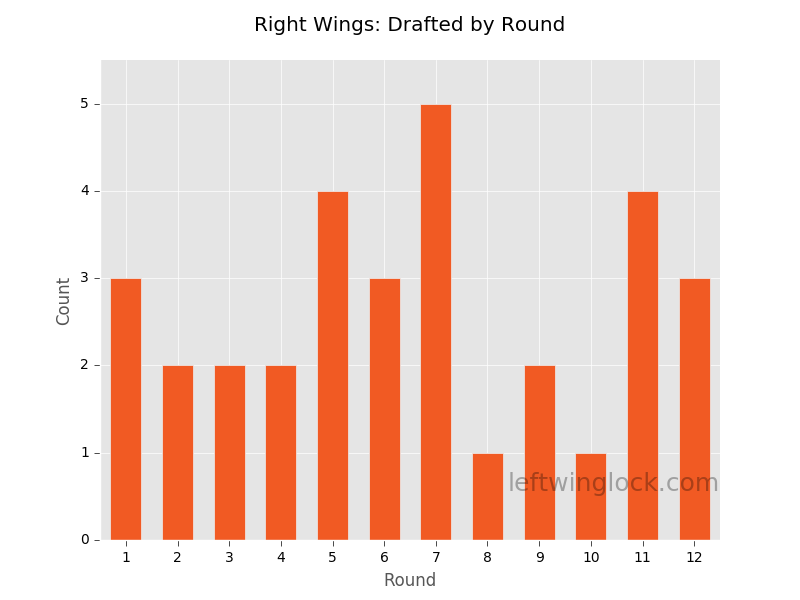 In the image below, you'll see exactly how many right wings are drafted in each round of a standard draft (on average). At the right wing position, three players are coming off the board in the first round (Nikita Kucherov, Patrik Laine, and Patrick Kane). One-third of all players drafted during rounds 5-7 have right wing eligibility. We can use this information to better understand who and when to take when our name is called during the draft. 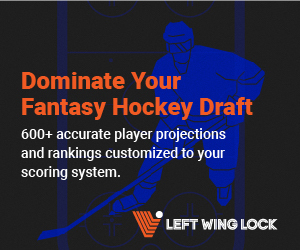 At leftwinglock.com, we create annual fantasy hockey draft kits which marry your scoring settings with our projections to generate customized player rankings. This exact type of draft kit was used by our team to crush the fantasy experts at NHL.com and includes sortable spreadsheets filled with projections in 20+ categories for over 600 NHL players. For the purpose of this article, we generated the customized player rankings for NHL players that can be drafted as left wings in the Yahoo fantasy hockey system. We then compare these player rankings to the player's ADP to determine which players are undervalued (it's never wise to draft on rank number alone). That is, we're looking for players who our draft system ranked highly and whom managers are overlooking. Below, you'll find a table of 14 players who are eligible at right wing and are being undervalued by managers in fantasy drafts (there are many more listed in our draft kit). Detailed comments for some of these players can be found below the table. Brock Boeser - As a 20-year-old, Boeser generated nearly three shots per game and earned nearly three minutes of power play time per game. If he plays the full season, he should be looking at 75 points with a signficant portion of those coming while on the power play. And while his shooting percentage might seem a bit high, there are no other red flags with Boeser. His sixth-round ADP is likely a result of the common misconception that Boeser will face tougher oppponents now that the Sedin twins have retired. This notion is predicated on years-old data when the Sedin twins were on the ice against the toughest opponents on any given night. 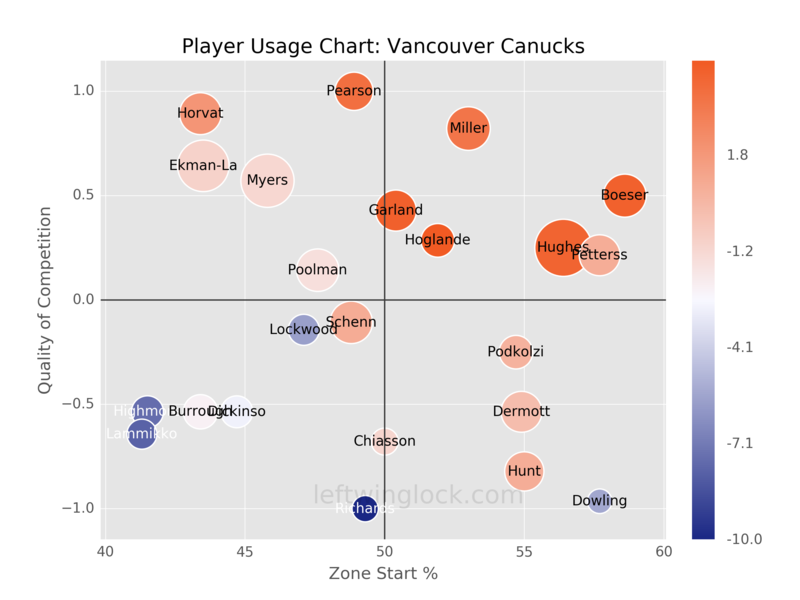 But, under Coach Travis Green, the Sedins were used in mostly sheltered minutes while Boeser's line saw the toughest opponents. Vladimir Tarasenko - While Tarasenko had somewhat of a down year in 2017-2018, it appears that fantasy hockey managers are suffering from a bit of recency bias. Tarasenko, just last Summer, was being selected as the eight overall player on average. He is now available as late as the third round in typical drafts. With the retirement of the Sedin twins this Spring, no star player in the NHL is on the receiving end of higher offensize zone starts than Tarasenko (68.6%). Tarasenko sees an added boost in standard leagues with the switch from PIM to Hits. Kyle Palmieri - Palmieri will quietly generate approximately 60 points, 220 shots, and find time to punish opponents with 120 hits. He'll earn more than 2.5 minutes of power play time per game and he's largely being ignored in drafts. His low individual points percentage (IPP) last season suggests that he was earning points at a rate inconsistent with his talent level. He can be drafted with ease in nearly any round. Patric Hornqvist - Hornqvist makes for a great late round pickup given his ability to produce across multiple categories. He earns over three minutes of power play time per game, generates considerable shot volume, and will produce more than two hits per game. He has added upside in that he's being considered for the right wing spot on Sidney Crosby's line this season. 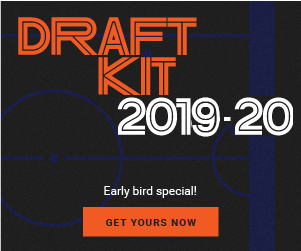 If you're looking for a chance to draft players with great projections that are being ignored by the other fantasy hockey websites, then consider downloading one of our fantasy hockey draft kits this season. You won't be disappointed. While this article focused on the Yahoo standard scoring system, our customized draft kits can handle just about any scoring system you throw our way. For 11 years, you've trusted Left Wing Lock as a reliable source to bring you accurate starting goalie information, line combinations, and player news alerts. That same passion and dedication fuels us as we create what we believe are the best fantasy hockey draft kits available. We invite you to let us build your customized fantasy hockey draft kit for the 2017-2018 season. Order your kit today! Want the most accurate fantasy hockey projections at your fingertips during the draft? An NHL player involved in this analysis. Click player name to visit player profile page. The current NHL team for this player. The official position designation for this player in the Yahoo Fantasy Hockey system. The rank assigned by Left Wing Lock for this player in this specific scoring system only. The average draft position for this player in the Yahoo Fantasy Hockey system.